Clean out, cash in or volunteer! 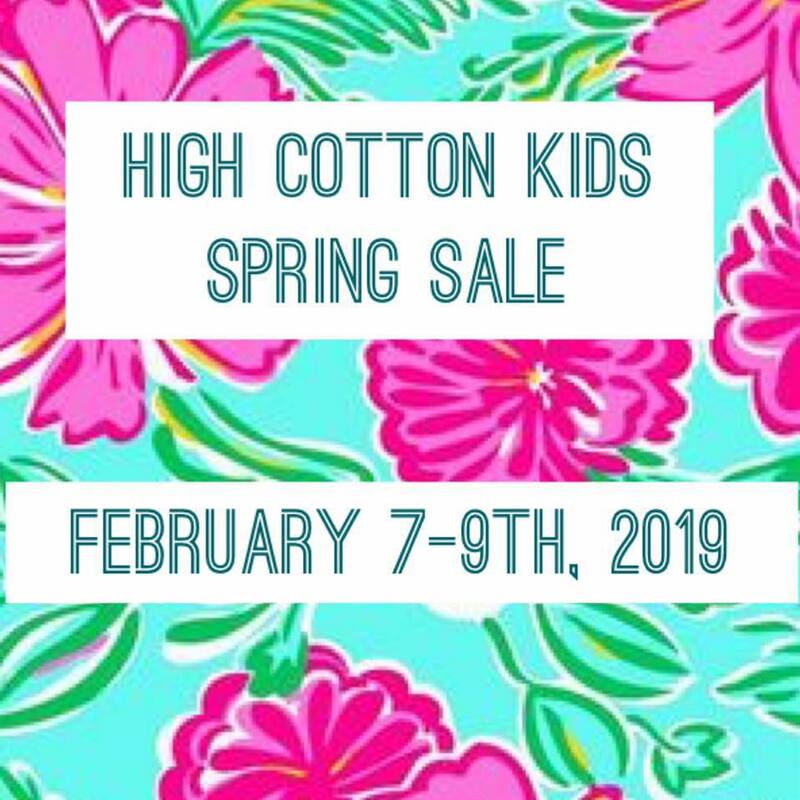 There’s still time to consign & volunteer for nt, High Cotton Kids Spring Sale 2019 Sale Feb. 7-9th in Savannah. Registration closes Mon. Feb.
4th, 2019 @ 11:59 PM. Don’t delay. Volunteers & Consignors get to shop early, on Wed. Feb. 6th. Volunteer registration also closes at midnight on Mon. Feb. 6th. Learn more about volunteering & consigning here. Clean out and cash in, consignors can receive 60-70% of their sales. For a complete list of items High Cotton Kids accept and do not accept click here..
High Cotton Kids has some exciting giveaways this year including preview party passes, line-hopper passes, merchandise from select vendors and gift certificates to the show. The dates of this years Spring Sale 2019 are: Fri. March 1 & Sat. March 2 2019. Sell your children’s gently-used items. REGISTRATION WILL CLOSE ON Feb. 22. Register online to become a new or returning seller here. The Junior League of Savannah’s 70th Annual Thrift Sale will be @ the National Guard Armory on Sat. Oct. 12, 2018, 7:30AM-3PM. The Thrift Sale brings together thousands of community members, each one making a difference through donations, volunteering, and purchasing of thrift. The money raised goes back to support the community improvement projects of the Junior League. 9AM-2PM. Admission will be free for the Sunday sale day. Thrift Sale Preview Shopping is an opportunity to get a first look at all the great items available to the community during the annual Junior League of Savannah Thrift Sale 5:30-7PM Friday. All thrift items will be available for purchase at 2x (two times) the marked Thrift Sale price. All net proceeds then go back into the community, funding the community efforts of the Junior League of Savannah. Preview Party tickets are $20 and include music by Rick Elvis, light hors d’oeuvres, Kendra Scott Trunk Sale, and raffles. Tickets can be purchased in advance through the Junior League of Savannah website: jrleaguesav.org. A limited number of tickets will be available for purchase at the door. The Annual Thrift Sale, is one of the largest of its kind in the South East. Each year people come from all over the Low Country to shop for treasures and bargains. The Sale, held each fall, is a primary source of funding for the Junior League. All of the proceeds from the sale are returned to the community through Junior League community improvement projects as well as developing the leadership of the Junior League members. 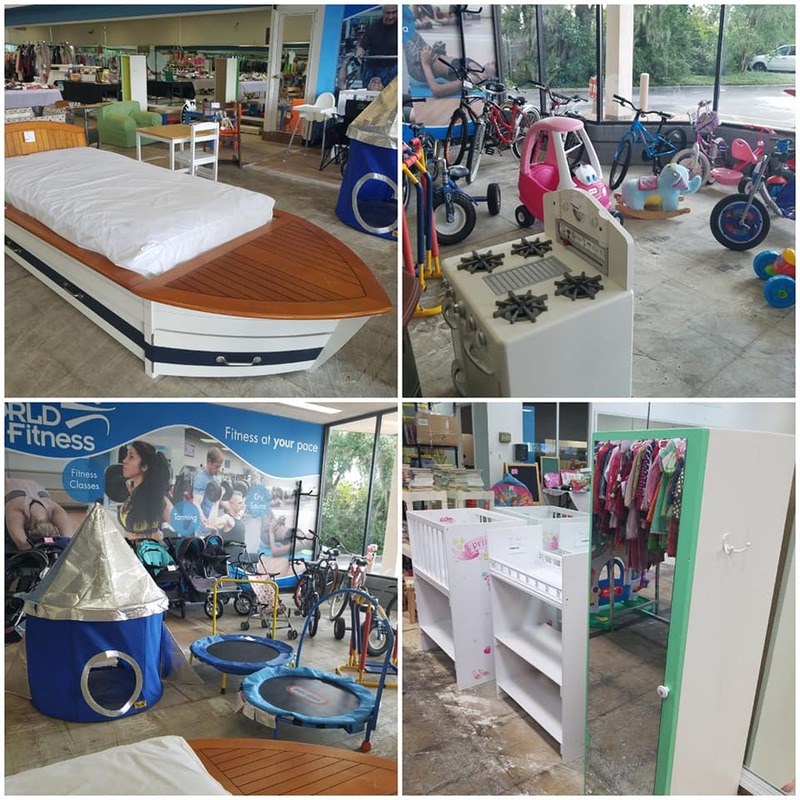 The sale also provides the community with a low-cost option to purchase needed household goods. All of the net proceeds go directly into the community through a combination of League-sponsored volunteer projects, community grants, and development of leadership skills of our members. This is a great way for students and others to furnish their apartments or dorms on a limited budget. Many families do their holiday shopping at the sale. There are always a lot of cool, vintage items as well as sofas, tables and chairs, and desks. Other finds include: appliances, bed linens, bicycles, and holiday décor, and plants. The children’s area comes stocked with clothing, swings, strollers, cribs and more. New Boutique offers items that are brand new at amazing discounts. This year the sale will also feature women’s business and formal attire. Questions? Call the Junior League office 912.790.1002. It’s giveaway contest time! 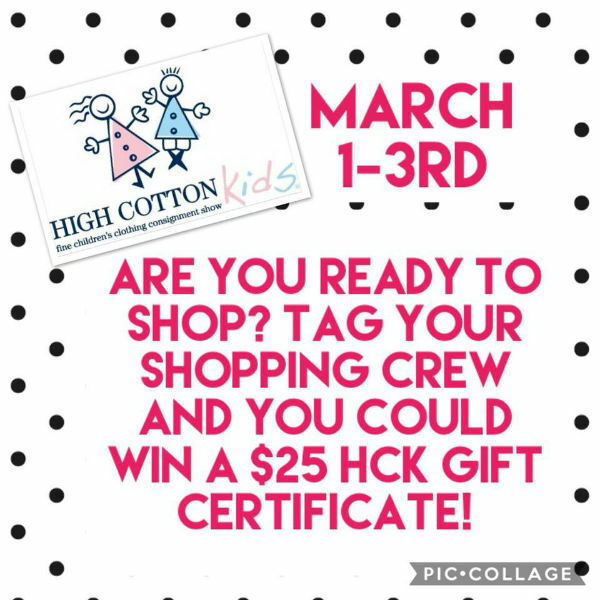 $25 High Cotton Kids Gift Certificate is up for grabs! Visit the High Cotton Kids Facebook page here & go to the giveaway post. Tag your shopping crew when commenting and you could win! 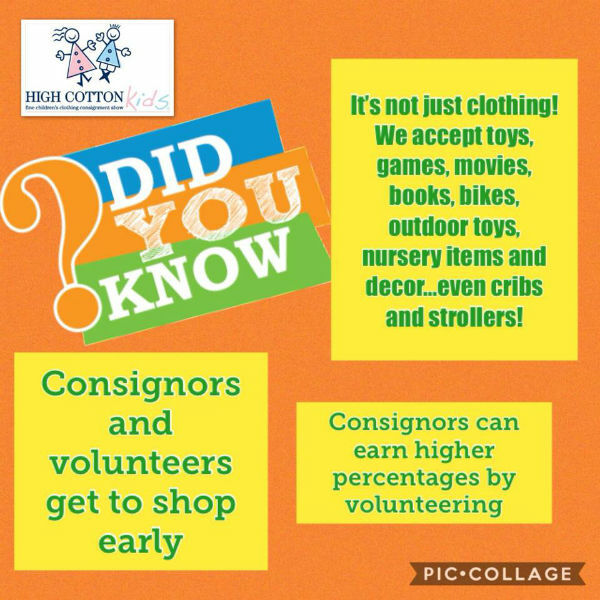 There’s still time to consign & volunteer for High Cotton Kids Spring 2018 Sale March 1-3 in Savannah! Registration closes Sun. Feb. 25 2018 at 11:59 PM! Don’t delay! Volunteers & Consignors get to shop early, on this Wed. Feb. 28. Volunteer registration also closes at midnight on Sun. Feb. 25. Learn more about volunteering & consigning here. Tagging deadline has been extended to Mon. Feb. 26. Savannah’s biggest children’s consignment event – High Cotton Kids – is set for November 18 & 19 2017. Hours: Sat. Nov. 18 10AM-5PM and Sun. Nov. 19 1-5 PM. Come shop consignment at its finest. High Cotton Kids is THE place to save a lot of money, make a lot of money and have a great time doing both! This fall’s upscale resale shopping event will have thousands of high-end boutique children’s brand clothing sizes 0-12 and many other items. There will also be a variety of sponsors and vendors with great products, merchandise and services! Consignor registration is open! Clean out and cash in, consignors can receive 60-70% of their sales! High Cotton Kids also accepts high-end maternity clothing, children’s furniture, artwork, baby and nursery necessities (e.g. bouncers, exercausers, etc. ), strollers, toys, books, DVDs and more. For a complete list of items we accept and do not accept click here. Registration deadline: Tues. Nov. 14 2017 at 11:59PM. Stay connected and get updates about the event by liking High Cotton Kids on Facebook here. High Cotton Kids has some exciting giveaways this year including preview party passes, line-hopper passes, merchandise from select vendors and gift certificates to the show! 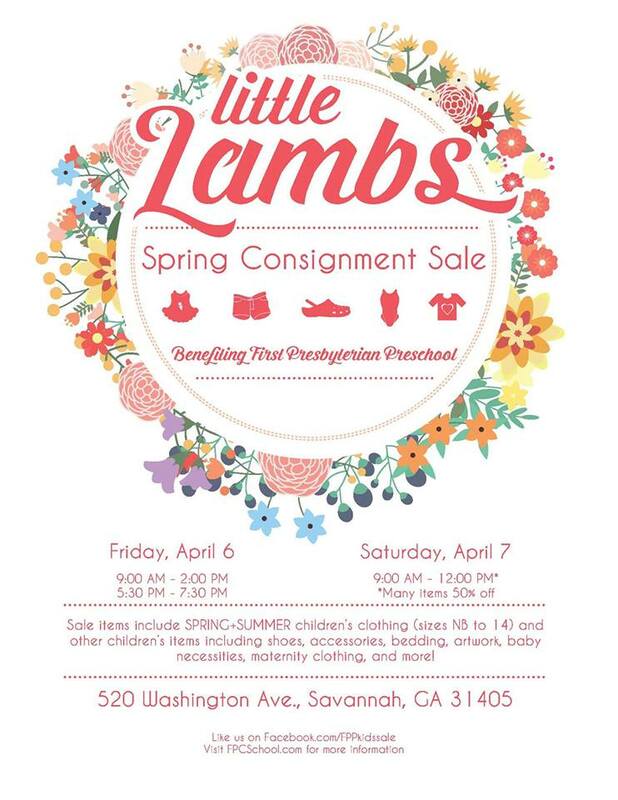 Come shop gently used baby and kids clothes, toys, books and more @ one of Savannah’s most popular children’s consignment sales: Little Lambs Sale. 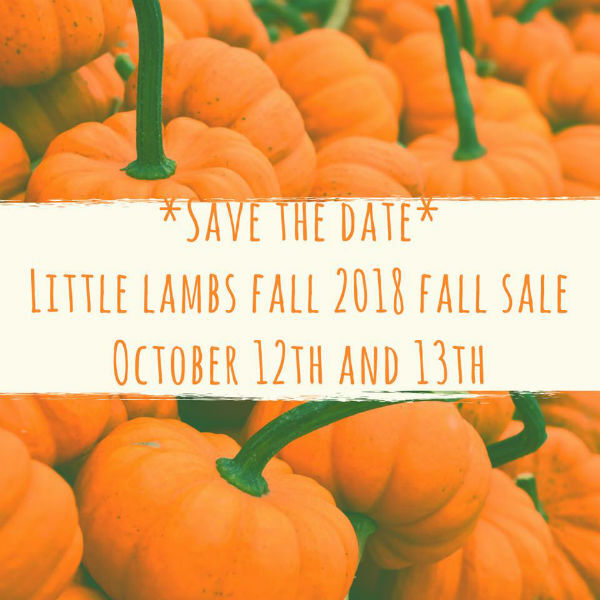 Little Lambs Fall 2017 Consignment Sale will be Oct. 13 & 14. The Little Lambs Fall Consignment sale is a great place to buy gently used Fall/Winter clothing or children’s furniture or toys or books. If you would like more information about shopping, selling or volunteering at the sale, visit Little Lambs Sale.